Can your business be environmentally conscious when dealing in energy dependent industrial rubber and plastic materials? We have all seen images of the turtle and the plastic six-pack ring or sea birds navigating piles of plastic bottles washed ashore. In consumer disposables such as drinking straws and water bottles there has been a growing movement towards paper and alternate materials. Innovation has been far slower in environmentally challenging industrial products such as rubber and plastic hose and sheet materials. How can you balance the desire to be green with your business’s requirements for environmentally challenging materials. Rubber and plastics are not only fossil fuel dependent in their manufacturing and transport but they are also made directly from petroleum based materials. Many industrial hose and sheet products also incorporate tightly wound textile and metal braids, leaving them neither recyclable nor biodegradable. If these materials cannot break down naturally or be recycled, then in order to reduce landfill waste, considerations must be taken in purchasing and usage. Bioplastics (plant based alternatives to traditional petrochemical based plastics) may be the long term solution for industrial rubber and plastic products. However, there are no viable alternatives on the market for most rubber and plastic hose assemblies, tubing, and seal materials. If we cannot make better industrial rubber or plastic products (yet), what measures can be taken in sourcing, use, and disposal to minimize the environmental impact? There are many factors to consider in the ‘greenness’ of any product, including the typical lifespan, the manufacturing process, biodegradability, and how far it travels. As wholesalers, retailers, and end-users; we have control over some of these aspects more than others. Buying local reduces the environmental impact from shipping; however in a global economy components often crisscross the globe through production and distribution. A company located farther away may take better environmental steps than one nearby, or source their parts local to them. These variables add challenges to sourcing responsibly. Any reduction in the replacement for consumables is a highly impactful way to reduce the environmental footprint of a business that can also create cost saving benefits. There are costs involved in purchasing, shipping, accounting, and waste hauling for every item consumed by a company. Buying better material less frequently should lead to a reduction in time and cost of purchasing, accounting, unpacking and stocking shelves, and waste hauling. Paying slightly more for a product that stays in service longer could partially, or fully, pay you back for being environmentally conscious. Select a high quality hose that is designed for your application. A hose that is not rated for the pressure, media, or type of service is going to end up in the landfill much quicker than a hose that was properly chosen. Also take special consideration in applications where there is abrasion, flexing, or vibration, as this can wear out an ill-suited hose assembly. Buy what you need for the foreseeable future, but not more. It may appear to be cheaper to buy a lot more than is needed, but keep in mind that rubber and plastic products have a shelf life and also must be stored properly. Leave it to the wholesaler to provide fresh material as is needed. Weigh the cost of upgrading to a brand name or higher grade model. What are the potential expenses and impact to your company’s image if a hose fails onsite? Consider the real possibility of injury or damage to equipment or to the work space. Also consider the expense and waste when a product is found unsuitable and must be disposed of and repurchased. For equipment manufacturers it may not seem a concern as long as the equipment is sold with a functional hose, but how does it reflect your company’s image? How would it improve that image to provide a high quality product that may offer a longer service life? For equipment rentals and sales, a higher quality accessory minimize issues during rental that otherwise may be costly and reflect poorly. A well performing product may also lead to rental buyouts; whereas a lower grade hose may have been at the end of its service life. 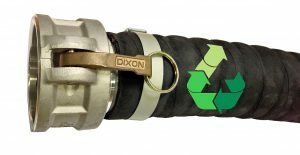 Well-designed hose assemblies may lead to additional rentals or sales rather than quickly ending up in a landfill. Upcycling has become a trend in everything from building materials to barn doors. Sure a used suction hose out of a rental yard is less appealing, but does it have any possible life in an alternate application? Hose can be cut shorter and re-coupled, or cut down and used for drainage. Hose with leaks can become a sprinkler, a bumper, a chute, or anything that you can imagine. Rubber sheet can pad a workbench or line a shed. Lay-flat hose can be slit lengthwise and flattened, which can make a bench or cover or mat. Fire hose has become popular in numerous upcycle applications from seating to slings. Also consider that this is not limited to used hose and rubber products. We have had seen plastic drain cleaning hose become dog chew toys (new material only!) and supplied movie sets for background settings. If you have a great idea, we have unused scraps and most factories have more. Offset environmental impact of your business buy sourcing items that can be recycled or are manufactured from recycled materials where possible. Sort and segregate items or waste that can be turned in for scrap. Check with nearby organizations to donate worn but functional materials, it may lead to a tax deduction (no research has been made to support this claim). Several years ago we identified our metal hose clamp tails as salvageable scrap. We now turn in thousands of pounds of steel annually which helps to offset the expense to recycle cartons and other materials. A review of everything from delivery truck routes to the settings on the thermostat can create time and cost savings and reduce the company’s environmental footprint. Most rubber and plastics are neither recyclable nor biodegradable. Plastics have been found to break into smaller pieces over a timeframe that could be hundreds of years or more. Those tiny pieces can be harmful to waterways and animal life. Many of these polymers have existed for less than half a century, so the very first batches may still be around. We often consider a product to be disposable if it is not required to remain in service for long. However calling something disposable implies that it disappears once its useful life has come to an end. Someday we should have truly recyclable and biodegradable industrial hose and sheet rubber products. Until then we can act responsibly as an industry to maximize usage and limit waste.